Alexis Rockman, “Hudson Estuary,” 2011. Oil and alkyd on wood, 40 x 80″. Courtesy of the artist. Photo by Brian Buckley. It is well known that as an urban New York City kid Alexis Rockman followed his anthropologist mother through the halls of the famed Museum of Natural History where his gaze was continually drawn into the dioramas of Charles Abel Corwin, Duncan Alanson Spencer, Florence and Frank MacKenzie, Hanson Duvall Puthuff, and Robert Russell Reid. As he matured into a successful painter, against the tides of faddish ’80s art world trends, he kept his focus on environmental activism producing twisted phantasmagorias of the “new” natural history, i.e., the wounded, ill, interconnected environment of catastrophic climate change, rampant toxic waste, and the general hell that the human animal has set forth upon this living earth. Although the dioramas of his childhood echo in the texture of the light and space, the color palette, and pedagogical tone of his work, his are hardly serene tableaus but dark, daring mixes of monster movies, Color Field painting, sci-fi pop culture, and rigorous science. His work is about history, made of history, and interested in the future history of our planet. He is part science teacher and part natural history madcap; the nerd art star who unites art and science into a powerful storytelling device. 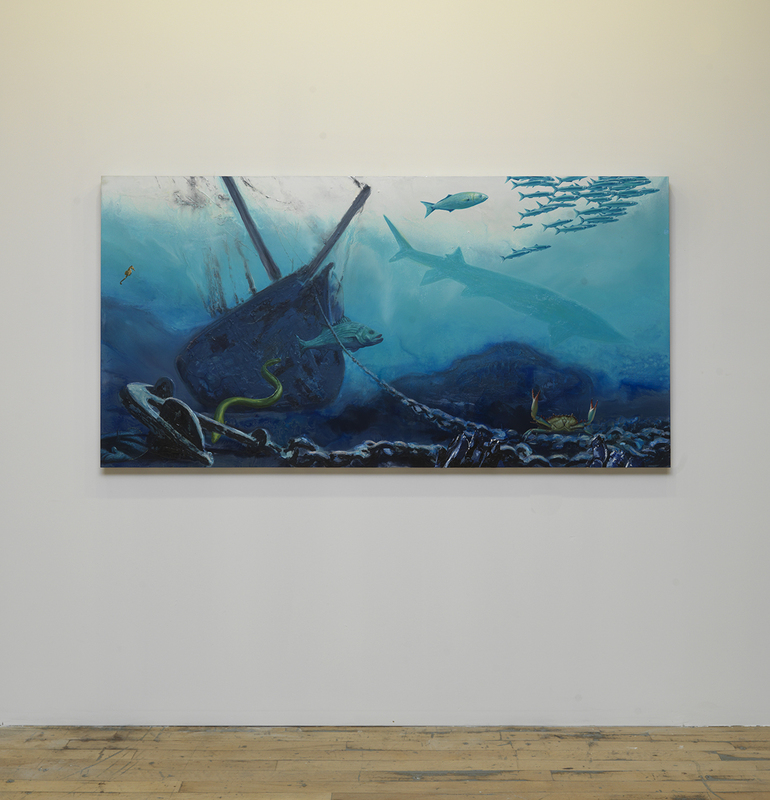 The above triptych is a time travel portrait of the underwater environment of the Hudson River made over nine months in 2011 after Rockman completed his monumental mural Manifest Destiny in 2004 for The Brooklyn Museum. In order to do background research he phoned Chris Browser, the education coordinator of the New York State Department of Environmental Conservation for the Hudson River Institute and according to Browser—who was a fan of Rockman’s work in Natural History Magazine well before Rockman surprised him with the call—Rockman’s meticulous care and curiosity about the facts of the science he includes in his work impressed him. “Alex is a true lover of zoology, micro-biology, and all the scientific data that goes into his paintings—in this way he is an educator because his paintings present scenarios that make people think. For instance, if the water gets warmer, then what will these various life forms become?” Such is the tale of the Hudson triptych that was in the Surviving Sandy exhibition which moves from the 17th-century underwater scene of Hudson Estuary with renderings of the actual fish and plankton that would have filled the river during the early Dutch colonization of the Hudson, to (Food Web) a zoom into a present day water drop set under a microscope (hence its oval shape) opening up into the teeny tiny plankton that form the very base of the food chain found in the Hudson today, to, finally, Tropical Migrants, a suggestive underwater fantabulist scene set by the wreck of a mysterious subway car, of the very fish and undersea life that, according to Bowser and Rockman (who worked out the possibilities organism by organism), would most likely evolve from the intermingling of local and tropical plankton in an ever warming Hudson River of the future. Interview with Dan Tranberg, Art in America, December 2010.